Longchen Nyingtik Ngöndro (Tib. ཀློང་ཆེན་སྙིང་ཐིག་སྔོན་འགྲོ།, Wyl. klong chen snying thig sngon 'gro) — the root verses of the Longchen Nyingtik Ngöndro are mostly taken from the original terma of Longchen Nyingtik (‘the Heart Essence of the Vast Expanse’) revealed by Jikmé Lingpa (1730-1798), and are therefore the vajra words of Guru Rinpoche himself. 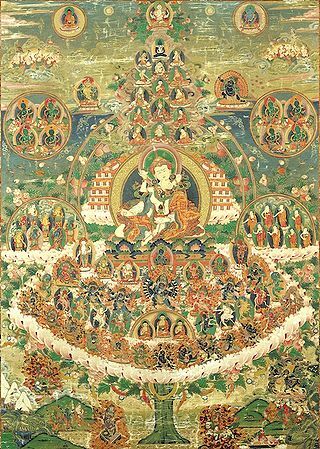 This profound and poetic revelation was then arranged and expanded by Jikmé Lingpa’s direct disciple, the First Dodrupchen, Jikmé Trinlé Özer (1745-1821), into its present form. Although we usually refer to this series of practices simply as the Longchen Nyingtik Ngöndro, its full title is ‘The Preliminary Practice of the Dzogchen Longchen Nyingtik: The Excellent Path to Omniscience’. Tulku Thondup, Enlightened Journey—Buddhist Practice as Daily Life, Boston & London, Shambhala, 1995. Khetsun Sangpo Rinpoche, Tantric Practice in Nyingma, trans. & ed. by Jeffrey Hopkins, co-edited by Anne Klein, Snow Lion, 1986. Tulku Thondup, The Dzogchen Innermost Essence Preliminary Practice, LTWA, 1982. ↑ Also available in A Guide to the Practice of Ngöndro, the Tertön Sogyal Trust, 2007. This page was last edited on 21 July 2016, at 11:17.